In Norse mythology, Geri and Freki (Old Norse, both meaning "the ravenous" or "greedy one") are two wolves which are said to accompany the god Odin. They are attested in the Poetic Edda, a collection of epic poetry compiled in the 13th century from earlier traditional sources, in the Prose Edda, written in the 13th century by Snorri Sturluson, and in the poetry of skalds. The pair has been compared to similar figures found in Greek, Roman and Vedic mythology, and may also be connected to beliefs surrounding the Germanic "wolf-warrior bands", the Úlfhéðnar. The names Geri and Freki have been interpreted as meaning either "the greedy one" or "the ravenous one". The name Geri can be traced back to the Proto-Germanic adjective *geraz, attested in Burgundian girs, Old Norse gerr and Old High German ger or giri, all of which mean "greedy". The name Freki can be traced back to the Proto-Germanic adjective *frekaz, attested in Gothic 𐍆𐌰𐌹𐌷𐌿𐍆𐍂𐌹𐌺𐍃 (faihufriks) "covetous, avaricious", Old Norse frekr "greedy", Old English frec "desirous, greedy, gluttonous, audacious" and Old High German freh "greedy". John Lindow interprets both Old Norse names as nominalized adjectives. Bruce Lincoln further traces Geri back to a Proto-Indo-European stem *gher-, which is the same as that found in Garmr, a name referring to the hound closely associated with the events of Ragnarök. The pair is also alluded to via the kenning "Viðrir's (Odin's) hounds" in Helgakviða Hundingsbana I, verse 13, where it is related that they roam the field "greedy for the corpses of those who have fallen in battle". 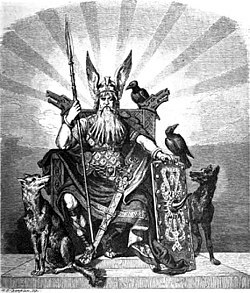 In the Prose Edda book Gylfaginning (chapter 38), the enthroned figure of High explains that Odin gives all of the food on his table to his wolves Geri and Freki and that Odin requires no food, for wine is to him both meat and drink. High then quotes the above-mentioned stanza from the poem Grímnismál in support. In chapter 75 of the Prose Edda book Skáldskaparmál a list of names for wargs and wolves is provided that includes both Geri and Freki. In skaldic poetry Geri and Freki are used as common nouns for "wolf" in chapter 58 of Skáldskaparmál (quoted in works by the skalds Þjóðólfr of Hvinir and Egill Skallagrímsson) and Geri is again used as a common noun for "wolf" in chapter 64 of the Prose Edda book Háttatal. Geri is referenced in kennings for "blood" in chapter 58 of Skáldskaparmál ("Geri's ales" in a work by the skald Þórðr Sjáreksson) and in for "carrion" in chapter 60 ("Geri's morsel" in a work by the skald Einarr Skúlason). Freki is also used in a kenning for "carrion" ("Freki's meal") in a work by Þórðr Sjáreksson in chapter 58 of Skáldskaparmál. If the rider on horseback on the image on the Böksta Runestone has been correctly identified as Odin, then Geri and Freki are shown taking part in hunting an elk or moose. A Vendel era bronze plate found on Öland, Sweden depicting a wolf-pelt warrior drawing a sword beside a dancing figure. Freki is also a name applied to the monstrous wolf Fenrir in the Poetic Edda poem Völuspá. Folklorist John Lindow sees irony in the fact that Odin feeds one Freki at his dinner table and another—Fenrir—with his flesh during the events of Ragnarök. Historian Michael Spiedel connects Geri and Freki with archaeological finds depicting figures wearing wolf-pelts and frequently found wolf-related names among the Germanic peoples, including Wulfhroc ("Wolf-Frock"), Wolfhetan ("Wolf-Hide"), Isangrim ("Grey-Mask"), Scrutolf ("Garb-Wolf") and Wolfgang ("Wolf-Gait"), Wolfdregil ("Wolf-Runner"), and Vulfolaic ("Wolf-Dancer") and myths regarding wolf warriors from Norse mythology (such as the Úlfhéðnar). Michael Speidel believes this to point to the pan-Germanic wolf-warrior band cult centered on Odin that waned away after Christianization. Scholars have also noted Indo-European parallels to the wolves Geri and Freki as companions of a divinity. 19th century scholar Jacob Grimm observed a connection between this aspect of Odin's character and the Greek Apollo, to whom both the wolf and the raven are sacred. Philologist Maurice Bloomfield further connected the pair with the two dogs of Yama in Vedic mythology, and saw them as a Germanic counterpart to a more general and widespread Indo-European "Cerberus"-theme. Speidel finds similar parallels in the Vedic Rudra and the Roman Mars. Elaborating on the connection between wolves and figures of great power, he writes: "This is why Geri and Freki, the wolves at Woden's side, also glowered on the throne of the Anglo-Saxon kings. Wolf-warriors, like Geri and Freki, were not mere animals but mythical beings: as Woden's followers they bodied forth his might, and so did wolf-warriors." In a biological symbiosis one organism typically shores up some weakness or deficiency of the other(s). As in such a symbiosis, Odin the father of all humans and gods, though in human form was imperfect by himself. As a separate entity he lacked depth perception (being one-eyed) and he was apparently also uninformed and forgetful. But his weaknesses were compensated by his ravens, Hugin (mind) and Munin (memory) who were part of him. They perched on his shoulders and reconnoitered to the ends of the earth each day to return in the evening and tell him the news. He also had two wolves at his side, and the man/god-raven-wolf association was like one single organism in which the ravens were the eyes, mind, and memory, and the wolves the providers of meat and nourishment. As god, Odin was the ethereal part—he only drank wine and spoke only in poetry. I wondered if the Odin myth was a metaphor that playfully and poetically encapsulates ancient knowledge of our prehistoric past as hunters in association with two allies to produce a powerful hunting alliance. It would reflect a past that we have long forgotten and whose meaning has been obscured and badly frayed as we abandoned our hunting cultures to become herders and agriculturists, to whom ravens act as competitors. 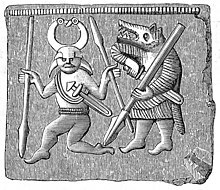 Wikimedia Commons has media related to Geri and Freki. ^ Simek (2007:90; 106); Lindow (2001:120; 139). ^ Lindow (2001:120 and 139). ^ Lincoln views this activity as the reason behind their epithet "ravenous" or "greedy". See Lincoln (1991:99). ^ Faulkes (1995:135 and 204). ^ Faulkes (1995:136 and 138). ^ a b Speidel (2004:24—28). ^ Bloomfield also mentions another Nordic pair in this connection: Geri "Greedy" and Gifr "Violent" are two dogs which guard the maiden Menglöð in the Fjölsvinnsmál. See Bloomfeld (1908:316–318). ^ Heinrich (2006 : 355). For discussion of wolf and raven symbiosis, see for example Heinrich (2006 : 226–235). For discussion of wolf and human symbiosis, see for example Henrich (2006 : 236–244). Bellows, Henry Adams (1936). The Poetic Edda. Princeton: Princeton University Press. Bloomfield, Maurice (1908) "Cerberus" in: Hastings, James (Ed.) Encyclopaedia of Religion and Ethics, Vol. 5. Edinburgh: T. & T. Clark. Grimm, Jacob (1882). Teutonic Mythology, Vol. I, Translated from the 4th Edition by James Steven Stallybrass. London: George Bell & Sons. Lincoln, Bruce (1991). Death, War, and Sacrifice: Studies in Ideology and Practice. Chicago: University of Chicago Press. ISBN 0-226-48199-9. Orel, Vladimir (2003). A Handbook of Germanic Etymology. Leiden: Brill. ISBN 90-04-12875-1. Silén, Lars (1983). "Några Reflektioner Angående Bilderna på Balingsta-Stenen i Uppland" (PDF). Fornvännen. Swedish National Heritage Board. 78: 88–91. Retrieved 2010-01-28. This page was last edited on 11 April 2019, at 13:22 (UTC).